^ Joseph Esherick. Remaking the Chinese City: Modernity and National Identity, 1900-1950. University of Hawaii Press. 2002: 27– [16 May 2012]. ISBN 978-0-8248-2518-8. ^ Pak-Wah Leung. Political Leaders of Modern China: A Biographical Dictionary. Greenwood Publishing Group. 2002: 17– [16 May 2012]. ISBN 978-0-313-30216-9. ^ Leslie H. Dingyan Chen. Chen Jiongming and the federalist movement: regional leadership and nation building in early Republican China. Center for Chinese Studies, the University of Michigan. 1999 [16 May 2012]. ISBN 978-0-89264-135-2. ^ 6.0 6.1 6.2 6.3 6.4 6.5 6.6 6.7 6.8 陈炯明研究 互联网档案馆的存檔，存档日期2011-07-08. ^ 陈炯明墓园修复方案初定 总面积近6000平米(图). [2011-01-02]. （原始内容存档于2010-11-23）. ^ 佟以群. 《彭湃與海豐農民運動 1921-1924》 (PDF). 《中正歷史學刊》 (台灣: 國立中正大學歷史學系《中正歷史學刊》編輯委員會). 2006, 第八期: 213–216页. ^ 郭德宏. 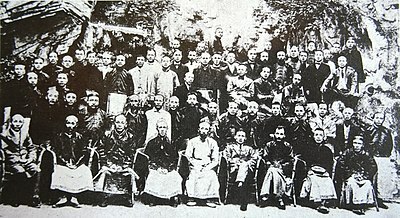 《1925年 29岁》. 彭湃研究丛书 《第一卷 彭湃年谱 （郭德宏 编）》. 北京: 中共中央党校出版社 2007年9月第1版. 2007: 第244页. ISBN 978-7-5035-3673-1. ^ 何桂蓝. 方言乐队“五条人”：玩音乐还是玩方言. BBC中文. 2018-08-07 [2018-11-21] （中文（简体）‎）.